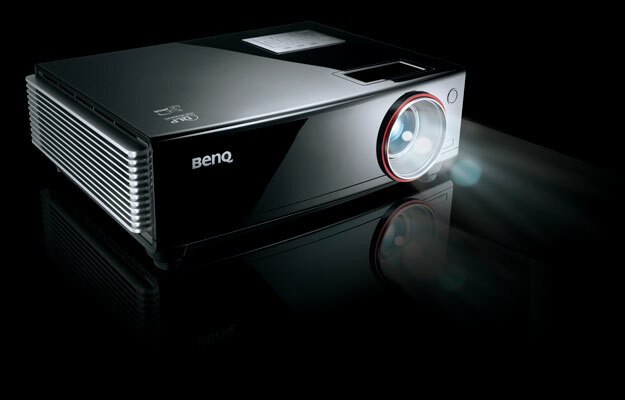 The BenQ SP870 is the brightest most cost effective projector for digital signage, AV or other projection requirements. 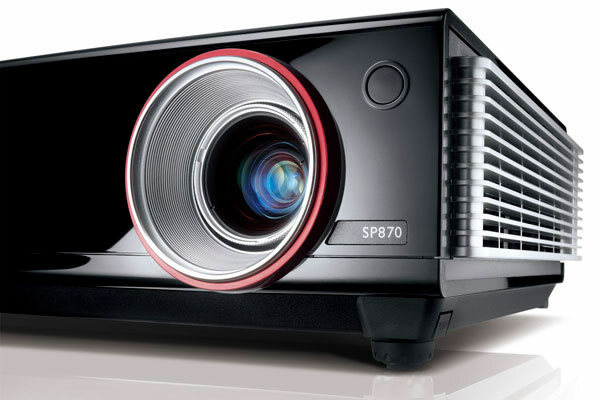 Light and compact with 5000 ANSI lumen brightness and 2000:1 contrast ratio, the BenQ SP870 offers superior viewing experience even in rooms with the lights on. With the complement of BenQ’s BrilliantColor, 3D color management, and UNISHAPE, an extraordinary picture is all you’ll get! It doesn't matter where you are, with 5000 ANSI lumen high brightness, the SP870 will always give you the best clarity under the brightest lights! So, take advantage! Stay in control and enjoy perfect presentations and the best interactions with your audience! The SP870 comes with XGA native resolution up to 1024 x 768. This brings you crisp and accurate images in your every presentation! The high 2000:1 contrast ratio means fine details and subtle color differences are rendered vividly even in darkly lit scenes. 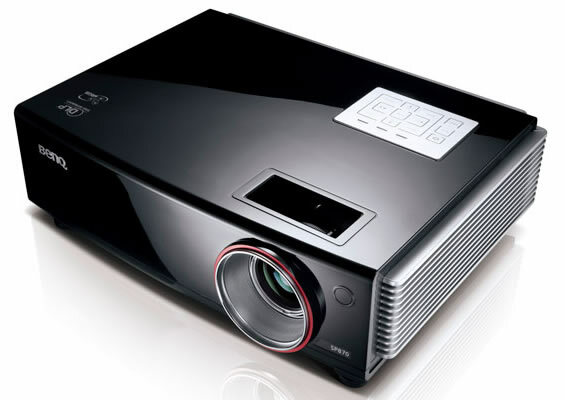 Thanks to BrilliantColor™ Technology, the BenQ SP870 DLP® projector delivers true-to-life images with enhanced secondary color brightness for your visual enjoyment! 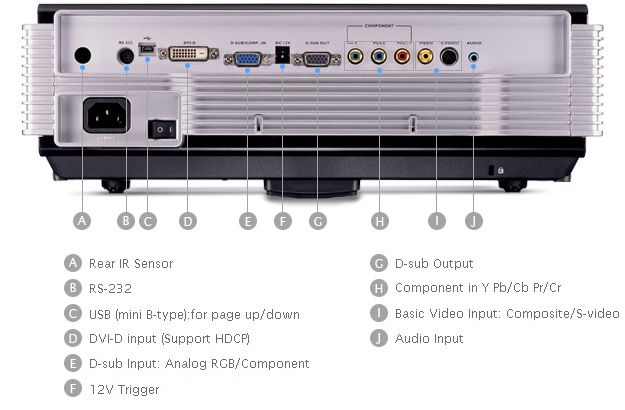 The built-in 3D Color management technology gives you the pleasure of adjusting the color intensity with the independent control of six colors' (R/G/B/C/M/Y) hue, gain, and saturation levels. Lamp Care - The SP870 can detect the bulb temperature automatically, making sure the temperature is cool enough before it allows the lamp to power up. Presentation Timer - The preset on screen messages or audible beeps keeps you on the right track! Now, you'll be making eye contacts with your audience instead of your watch. Quick Cooling - Cooling time itself has been reduced by over 60%, saving your time and minimizing the risk of heat damage to sensitive internal components. Wall Color Correction - BenQ has studied the world's most commonly used paint colors and developed easy-to-use wall color correction technology that will ensure you precise color performance on all surfaces. Panel Key Lock - Use the control console or the remote to press the lock-key and be safe from accidentally pushing the wrong buttons. Now, you'll be safe from having your presentation disappear from view! Auto Off - A smart auto off feature shuts the projector down when no input sources are detected after a preset interval. This feature not only conserves power, but also prevents possible overheating.